This article is a brief introduction about multichannel IVR servers in relation with Ozeki VoIP SIP SDK. After reading through this page you will be fully familiar with all the essential terms concerning multichannel IVR server solutions and what you will need for creating your own solution using Ozeki VoIP SIP SDK. Interactive Voice Response (IVR) systems are used in telecommunication for getting interaction from human callers by using DTMF signals or spoken words. 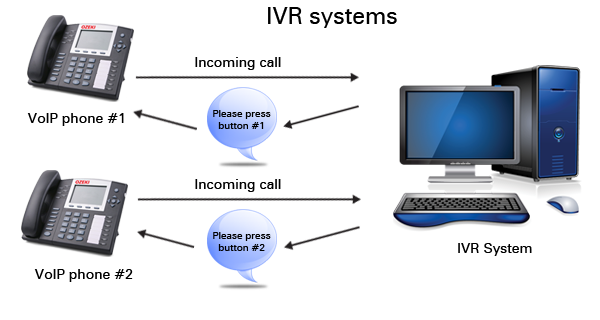 The IVR system basically uses a tree structured menu system that can be navigated in with voice or pressing the telephone buttons. The IVR systems are usually used by big companies where a lot of clients can have the same problem that can be answered mechanically without the need of an actual human agent to talk with. When implementing an IVR server, you need to consider the most possible fields the IVR tree should contain and you need to sort them into a hierarchical structure. This tree structure has to be implemented and the navigation in it needs the background support for DTMF and/or voice recognition. Ozeki VoIP SIP SDK grants all the support you will need to create an IVR system and for implementing any navigation method you need. You can extend an IVR solution with multiple call support in a simple way. First of all you need to have an SDK license that has multiple call support than you can simply use some extensions. You can also extend these solutions with human operator support. In that case the calls can be transferred to an operator from the call center server. For solutions of this purpose please check IVR human cooperation page. If you would like to visit the detailed developer documentations, you can learn much more from the Ozeki VoIP SIP SDK Training: C# Basic IVR and Multi-level IVR lectures.